February 13: RMF Board Meeting at 7:00 PM. Members are welcome to attend any board meeting. Check with a Board Member for the meeting location and/or agenda. Rocky Mountain Flycasters chapter of Trout Unlimited presents its annual Fly Tying Expo Wednesday February 20th. Experienced and beginning tiers will have a chance to learn from the area’s best guides, authors and designers. 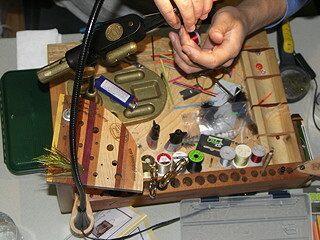 A beginners’ bench will offer those who "have always wanted to try that" the opportunity to create their own first fly. The Expo will take place at the Fort Collins Senior Center, 1200 Raintree Drive, Fort Collins, Colorado. Doors open at 5:30 pm. A meal and raffle entries are included in ticket price. Grab the Poster Funds raised at the event support chapter conservation and education projects, including restoring the fishing pier on the Big Thompson River, greenback trout restoration in George and Cornelius Creeks and the upper Poudre Basin, and the annual Teen Conservation and Fly Fishing Day Camp. Admission at the door is $20 for adults, $10 for students with ID, under 12 free. Admission gets you a plate of food provided by Caninos, ten raffle tickets (five for paying students.) Raffle tickets may be used for drawings for the tiers flies and/or a fly rod. A silent auction and a live auction will give you an opportunity to bid on quality gear, supplies, books, and art. Rocky Mountain Flycasters was the tenth chapter authorized by Trout Unlimited, the nation’s largest coldwater conservation agency, and is thirty-five years old. Come join CPRW at Pour Brothers on Wednesday, February 20th from 6-8pm for Pint Night! All tips generated between 6-8pm will go to CPRW. poudrewatershed.org.